During late adolescence, wisdom teeth start to appear and occasionally are accompanied by oral pain, as well as an increased risk of dental issues such as redness in the gums (pericoronitis), gum disease, and tooth decay. 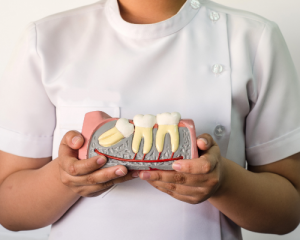 Through evaluation, your oral surgeon will determine the number of wisdom teeth present, as well as how they are developing in relation to the rest of your teeth. Using advanced imaging technology (3D CBCT imaging), an oral surgeon will discover if the teeth are partially or fully impacted, and then will create a strategic treatment plan in order to remove the teeth and ensure successful recovery. Although sedation is not always necessary, many patients have found anesthesia to be helpful in relaxation and reducing pain during the procedure. Additionally, you will be provided with other medications via your IV access, to help expedite your healing process (anti-swelling, long-acting pain medications, anti-nausea and possibly antibiotics). If sedation is chosen, there are certain preparations that must be made: patients must enlist the help of family or friends to bring them back home after their surgery. Just like any other surgery, you have present to the office on an empty stomach, meaning no eating for 6 hours BEFORE surgery. No worries, local anesthesia will be applied to the area, only after you are sedated. Then, specific surgical tool are used to remove tooth. Once the tooth is extracted, we will always sutures the gums over the extraction site closed – in order to expedite your healing process and to prevent food from getting trapped in the extraction sites. Wisdom tooth extraction can be an uncomplicated procedure that ultimately will protect your long-term oral health. For more information about wisdom tooth extraction, schedule your consultation with Dr. Massoomi today!